The poplar trees on the left are part of the Hayden Area Regional Sewer Board facility that are irrigated with recycled wastewater during summer months. The poplar on the right are part of the AHB demonstration site. Numerous environmental benefits can be obtained from growing poplar, and these environmental benefits may be important sources of revenue for future biofuel enterprises even in the face of low oil prices. Wastewater treatment plants, in particular, are excited about the potential for poplars to help filter and further clean treated wastewater. “We are environmentalists every day,” says Ken Windram, administrator of the Hayden Area Regional Sewer Board (HARSB). He’s talking about the work done at the wastewater treatment plant he oversees, which treats approximately 1.8 million gallons of pollution discharges from homes and businesses (sewage) a day. During most of the year, the plant pipes the treated wastewater (a.k.a. reuse water) from about 8000 homes and business in the area to the Spokane River, preventing it from polluting the ground and drinking water. However, during the summer months, the reuse water cannot be discharged to the river due to low flow, and the treatment plant has to do something different. In 1993, HARSB purchased 476 acres of farmland and started growing livestock crops (such as alfalfa) and poplar trees. The farm is irrigated with reuse water, following strict guidelines to prevent that water from entering the Spokane Valley-Rathdrum Prairie Aquifer. The HARSB needs crops that can drink a lot of water, since wastewater is coming in every day. “We’re in the business of getting rid of water,” Windram stressed during his presentation at the Poplar Willow Forum held in Portland, Oregon this spring. 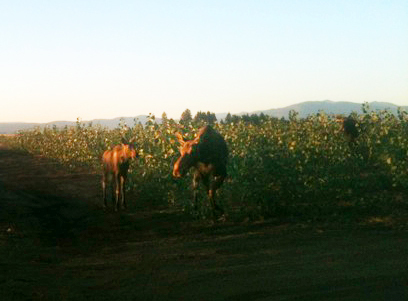 Poplar farms can provide habitat for small mammals, birds, amphibians, and other wildlife – like the moose pictured here. Unfortunately, some animal visitors can cause trouble on the wastewater farm by eating crops or damaging irrigation lines. That is not to say that there haven’t been some challenges along the way. Coyotes sometimes chew on the irrigation lines, which then need to be fixed. In addition, 30 to 60 elk have found a hiding place in the AHB trees and come out at night to eat the wastewater farm’s alfalfa. The AHB poplars on the Hayden demonstration site are already using as much water as the poplars HARSB planted in 1993 – around 50 inches per acre throughout the summer. Part of the appeal of short-rotation poplars is that they only need to be replanted every twenty years, but can be harvested every two or three, due to a re-sprouting process called coppicing. In May 2014, after the first harvest, HARSB was anxiously watching the stumps to see how the second growth would work out. And indeed, by August, the Hayden poplars were well over 12 feet tall. 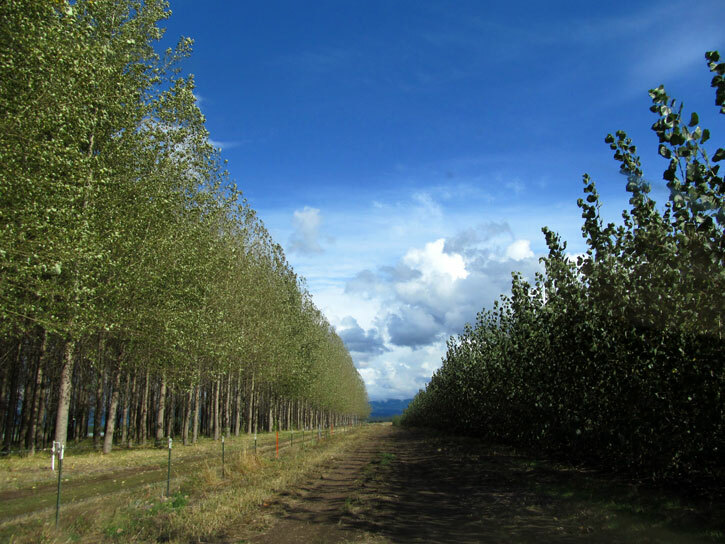 Additionally, while there is currently no market for the older, taller poplar trees, Windram believes there will be a viable market for the short-rotation trees. 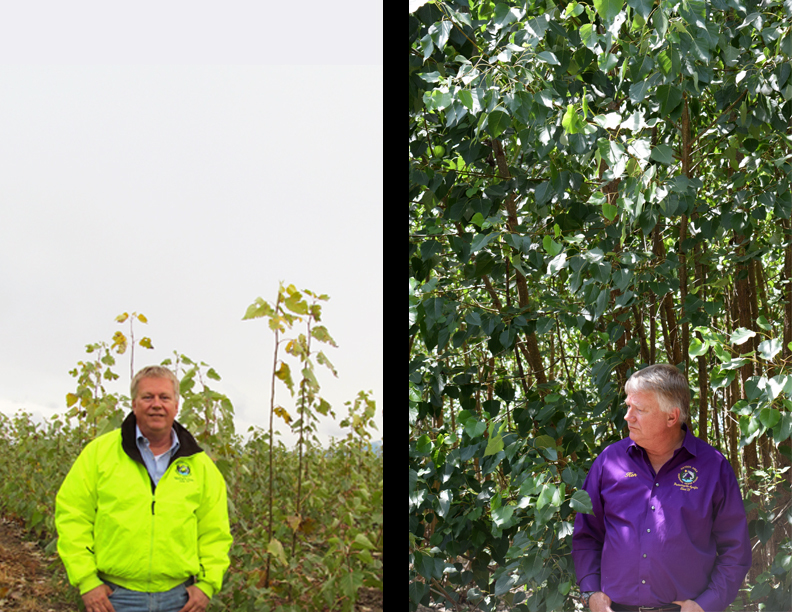 Looking towards the future, Windram sees great potential for a poplar-based biofuels and bio-based chemical industry in Northern Idaho. Growing poplars allows HARSB to take organic wastes and transform them into economic opportunities for the surrounding communities. Windram is interested in seeing the AHB project move forward, testing the potential of applying class A biosolids after every harvest, and irrigating with as much reuse water as possible in order to see just how much biomass they can produce. Windram believes short-rotation poplars could also prove an effective way for farmers and landowners to use their private water rights, which have a “use or lose it” policy.